The DCA Eagles sailed almost all the way across the Atlantic but last reported on June 22, 2017. With more help from the US Coast Guard and Mark Moore, she was redeployed in the Atlantic at 28 04.54N, 79 38.0W at 1200 EDT on 15 Mar 2016. On the morning of Feb 24, 2016, SS DCA Eagles landed on St Georges Island in the Apalachicola region of Florida where Tracy reported the local sheriff retrieving the boat and so kindly taking it to Ocala, Northern Florida, about 40 minutes away from where miniboat SS DCA Eagles originated. On Feb 19, 2016, she was launched in the Gulf of Mexico. Her adventure started with sailing NNW. 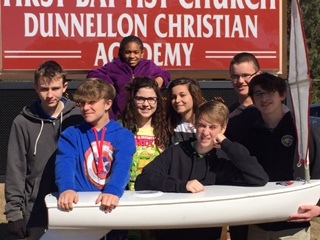 The SS DCA Eagles belong’s to Tracy Jenner students in Dunnellon, Florida at the Dunnellon Christian Academy.